Shrimp & Cheesy Grit Cake Bites – Ultra creamy grit patties are fried and served with a buttery sauteed shrimp and crispy bacon to create an appetizer that your guests will go crazy for. Pairs perfectly with any dinner party and the flavors of Chardonnay wine! Today is an important post. Well, all my posts are important (duh) but today is especially important because we’re talking wines. Wine is essential to any dinner party or get-together, am I right? I cannot host a function at our place without it. There would be a mutiny. But choosing the right wine can get tricky. Do you get red or white? What do you serve with the wine? In this post, I am going to feature a great wine for your next dinner party and the perfect appetizer to serve alongside of it. Meet the wine: Notable Chardonnay. Chardonnay is a great wine to serve a crowd because so many people love it. And with National Chardonnay Day just around the corner on May 21, this is the best way to celebrate! Notable Chardonnay comes in a California Chardonnay and an Australia Chardonnay. These are brand-new wines that hit shelves in March 2017. The most distinguishable (and convenient!) characteristic about these wines is that they highlight the flavor profiles right on the label so you know exactly how to pair the wine. See, don’t you feel more confident about this pairing stuff, already?? For this pairing, I’m going to focus on the flavor notes of the Notable: California Chardonnay. “Butter. Oak. Vanilla.” What do those adjectives mean to you, in terms of food? To me, I immediately think of rich and creamy pasta or a buttery shrimp or lobster that is either grilled or broiled. And for added oaky taste, maybe some bacon? Since we’re looking for a great appetizer, not a main dish, pasta and lobster are out. I love shrimp in ceviche and it’s a great appetizer but that’s out because it’s too acidic. Shrimp gumbo can be served in small little bowls with rice as another incredible appetizer options but that’s out because it’s too spicy. But wait…there’s another creole dish that just might be the perfect pairing for this Chardonnay and it is served with a rich and cheesy sidekick: Shrimp & Grits! To make shrimp & grits in the most appetizer-friendly dish, I made a favorite of mine that they serve at restaurants all over Atlanta: Shrimp & Grit Cake Bites. If you’ve never tried grit cakes, please warn your taste buds about the flavor explosion that is about to occur. The grits are cooked in a chicken broth, cream, and butter mixture and spiced with garlic and onion and a pinch of creole seasoning. So if the only grits you’ve had were bland, instant, and from a box, prepare to taste the right way to eat grits. Moreover, the texture explosion is what took these over the edge for me. You think grits are super creamy and dreamy? Imagine what happens to them once they get fried! Creaminess to the extreme. Full disclosure: I ate about 4 grit cakes before I added the shrimp. I just couldn’t stop myself! There is no denying that these rich, buttery, grit cakes will pair perfectly with the notes of the Chardonnay. But we still have to add one more element to them to elevate them to the next pairing level: sauteed shrimp, bacon, and veggies. You could always just use the shrimp on its own, but, like I said above, bacon adds a smokey flavor to the shrimp which will make it pair even better with the Chardonnay. And the veggies are necessary to add a little sweetness and freshness to already-rich shrimp and grit cakes. Plus, they add another color palette to the appetizer which makes them even more pleasing to look at, wouldn’t you agree? Easier than you thought, right?? The most fun part is cutting out the grit cakes and dredging them, at least it was for me. It’s not something I get to do that often so I had fun on that step. Who doesn’t like getting their hands a little dirty?! 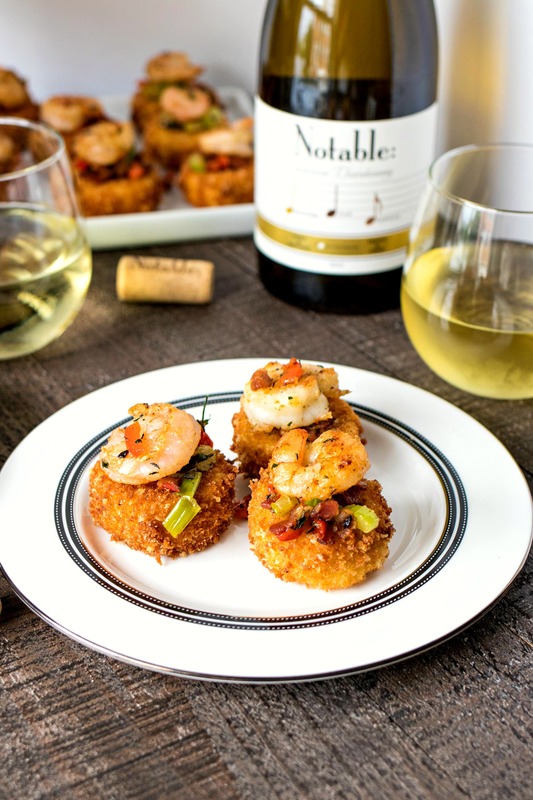 Once you take a bite of these shrimp & grit cake bites and sip of the Notable: Chardonnay, you’ll immediately notice how smooth the wine tastes when it hits your tongue. Wine-pairing success! Before serving the wine, let it sit out of the fridge for 20 minutes. Chardonnay is best served around 45 degrees, whereas you fridge is probably closer to 35 degrees. You get much fuller flavor from the wine when it’s at the correct temperature. Though we focused on pairing with the Notable: California Chardonnay, either Chardonnay variety will taste perfect with this appetizer. The grits have to be completely set before you start cutting circles. Therefore, I make mine the day before I need to serve the grit cakes so the grits have enough time to set in the fridge. Do not fry too many grit cakes at once. This will cause the oil temperature to drop and make your cakes all greasy before they have a chance to brown properly. Once the grit cakes have fried, you then turn your attention to the shrimp mixture. Shrimp take almost no time to cook, but just in case, it’s best to keep the grit cakes warm in the oven so they don’t get cold before serving. My oven has a “warm” setting that I use, but if yours does not, you can simply set between 180 to 200 degrees and that will do the trick. If you’re short on time on the day you are serving the shrimp & grit cake bites, you can make the grit cakes ahead of time and reheat in a 350-degree oven until warm, about 7-10 minutes. I do not recommend making the shrimp ahead of time because they can taste rubbery when reheated. Alrighty, now you have all you need for an amazing dinner party appetizer and wine pairing. How excited are you to try this pair together? You’re taste buds will surely thank you. And your guests are going to be so impressed! Make sure you check out the Notable Chardonnay site to find out where you can buy these new wines in your neighborhood! And don’t forget to celebrate National Chardonnay Day on May 21st! Ultra creamy grit patties are fried and served with a buttery sauteed shrimp and crispy bacon to create an appetizer that your guests will go crazy for. Pairs perfectly with the flavors of Chardonnay wine! First, we must make the grits before they can be assembled into grit cakes. Pour the chicken both, heavy cream, and water into a medium sauce pan. Add butter and seasonings and whisk together. Heat mixture over medium-high heat until it begins to boil. Once it's boiling, very very slowly pour in the grits while whisking quickly for 2 minutes. Reduce heat to medium-low, cover, and let cook for 30 minutes, stirring occasionally. Once grits have cooked and thickened, add shredded cheese and whisk together until combined. Taste grits and add hot sauce or salt, if needed. Grease 9x13 casserole dish or baking pan. Pour cooked grits into dish. Bang on counter a couple times to remove air bubbles. Let grits cool for 10 minutes and then cover and place in fridge to chill for at least 4 hours. It should be completely set before you cut out the grit cakes. Place flour, breadcrumbs, and eggs in three separate bowls. Beat eggs. Mix black pepper, creole seasoning, onion powder, and garlic powder in a small bowl. Distribute evenly between the flour, breadcrumbs, and eggs. Set aside. Remove set grits from fridge. Place a sheet of parchment paper on counter next to the grits. Using a 2 1/2 to 3 inch biscuit cutter, cut out as many circles as possible, about 20, and place on parchment paper. One at a time, roll in flour, shake off excess, dip in egg mixture, and then cover in breadcrumbs. Make sure you press on the breadcrumbs so that they stick on really well. Repeat with rest of grit cakes. Add 1 1/2 cups of oil to a medium heavy-bottomed skillet (I used my cast-iron skillet). Heat on medium heat. When oil is hot, carefully place four grit cakes in oil and fry for 1 minute per side. They should be deep golden brown. Remove from oil and place on paper towels to drain. Repeat with remaining cakes. Do not fry more than 4 cakes at a time, otherwise the oil temperature will drop too low. Once all cakes have fried, place on a baking sheet and keep warm in the oven while we make the shrimp. I have a "warm" setting on my oven, but if you don't, warm it up to 180 to 200 degrees. Heat skillet to medium heat. Add diced bacon and cook through until crispy. Remove and drain bacon on paper towels. Do not discard bacon grease. Pat down shrimp so that it's as dry as possible. Heat leftover bacon grease to medium high heat. Add shrimp and cook until bright pink, about 1 1/2 minutes per side. Remove from heat. If all the bacon grease is used up, add another 1 tablespoon of olive oil to skillet and heat to medium heat. Once hot, add shallots, scallion, celery, red pepper, parsley, thyme, and garlic. Cook until veggies soften, about 2-3 minutes. Add back the bacon and shrimp. Toss until combined. Turn off heat. Remove grit cakes from oven. Assemble grit cakes by placing a little of the bacon and veggie mixture on a grit cake and then top with a shrimp. Repeat with the rest of the grit cakes. Serve immediately. Any suggestions for making these and then traveling about an hour away to a place where I most likely can’t reheat? If possible, I would take a hot plate and a pan to cook in and reheat on low til everything is warm. I don’t recommend trying to heat and wrap them in foil and transporting. Although, I think the shrimp could be done ahead a served cold on top of the room temp grits. I’d have to play around a little. yesterday. My kids were annoyed they couldn’t enjoy them. Cut out the bites and fried them this morning, (shaped the leftover grits into patties and fried them for the kids to snack on) then warmed up the patties just to see how they would heat up and they were perfect. My guests are going to be so happy. Love this recipe, but it is labor intensive. Definitely a 2 day process for me. Hi Ronda! Thanks for sharing your experience! Yeah, these babies took a couple days for me too. But I did freeze a few of the finished ones so I can simple heat up in the oven next time I want to make them so I can save some time. leftovers. Into the freezer they go. A tip to minimize waste of the grits. I have done fried grits cakes for years and I use our muffin tins to create the cakes. Spray the tins with cooking spray, pour in the grits to desired thickness, chill, flip’em out, and voila you’re good to go with no waste. Great recipe by the way. These bites look so tasty! I’m definitely adding this to my must try recipe to-do list–thanks for the inspiration! Thanks so much, Cat! I hope you enjoy them! Those look so yummy!! And thanks for the info about the wine… I love it, but never have any idea what to pair it with. So glad I could help out! I hope you love the pair! Oh my gosh those look SO delicious! I love how you plated them in such a unique way. Hot oil is key! Test out one cake and if they don’t brown, wait a little longer until you do the rest. Good luck! Let me know how they come out! I. Am. Obsessed. I’ve never seen anyone do grits cakes. Grit cakes? Is there an s on Grits when in the form of a cake? lol Anyway this looks so delicious! Excited to hear about a new wine too! Haha! These grit cakes will change your life!!! You’re so sweet! I work really hard on my photography so that means a lot. Thank you! this is just perfect for wine wednesday!!! i love grits in general and your version sounds amazing. Ahh you’re so right! The best way to celebrate #WineWednesday! Thanks for this recipe and wine pairing! I know what I’m making for dinner tonight! This might be my new favorite recipe! Looks so tasty and so gorgeous too! And thank you for the wine pairing. Pinned and will be trying this bites soon! You’re so welcome! Let me know how you like the pair! My mouth is watering! I love shrimp and grits so I know I would love this!! You definitely will Thanks so much for stopping by! I’ve never had grits, but these are making me want to change that ASAP! Oh you are missing out!! You gotta make these the first ones you try so you know what they’re supposed to taste like. So many restaurants serve them instant-style and they’re gross and gloopy. This recipe will change your life. I’m a big foodie, and I love bite size dishes. This looks so yummy I definitely have o try to make this! Loooove bite-sized dishes! Thanks so much for stopping by and I hope you love them! And now I’m officially drooling!!! Every photo is amazing and I love the information you included regarding the pairing!! Aw thank you so much!! My goal was to make people drool so I am glad I succeeded!! These look divine! Your pictures are amazing, I really appreciate good photography and you did an excellent job! I have a dear friend who would love these grit cakes with shrimp. Will surprise her with these. Aw that’s great! You’re such a good friend! Those shrimp and grits cake bites look so yummy! Thanks for explaining step by step how to make them!